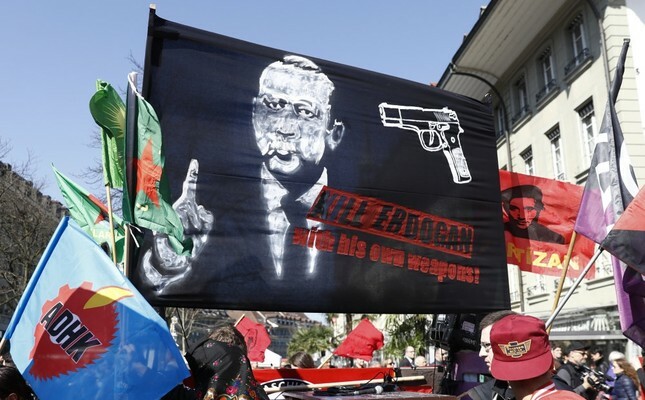 A banner that reads: 'Kill Erdoğan with his own weapons,' as protesters march during a demonstration, Bern, Switzerland, March 25. How many leaders are there in the world who can eloquently tell the world the truths it needs to hear? Do you also find it strange and incomprehensible that the answer is negative? I think the world has never seen such ambiguity of concepts, beliefs and feelings. For instance, although terrorism is – fortunately – widely still considered bad, there is no common definition of terrorism around the world yet. There are a dozen definitions of terrorism and some of them are regarded as quite legitimate. Massacres of civilians are whitewashed or ignored when an organization wages a war that suits the targets of powerful nations. Similarly, there is not an agreed upon, international definition of a coup yet. The overthrow of an elected government through a foreign-assisted coup due to opposition to its foreign policy, not by its own people through elections, is deemed positive, let alone criticized. The killing of some tens of thousands of anti-coup civilians by putschists during such a coup is accepted as casualties of democracy. After all, one cannot make an omelet without breaking eggs. But is there a common sensibility in the world regarding coups? Is there a common definition of and sanction against genocide and massacre? The U.N. once issued a declaration on the subject. We do not think anyone needs to learn what genocide is. Furthermore, the U.N. has adopted the Responsibility to Protect (R2P) doctrine in the early 2000s. But is it put into practice? Was it implemented in Rwanda and Bosnia in the 1990s? And is it implemented in Syria and Rakhine, Myanmar now? No. U.N. peacekeeping forces have withdrawn from troubled areas. There are 60 million refugees and 40 million modern slaves in the world currently. Both figures are equal to the population of a medium-sized country. But these people's countries either do not exist anymore, have collapsed or succumbed to violence. So, what is the civilized world is doing for these helpless people, other than paving the way for coups and civil wars and courting terrorist groups? How do they treat countries like Turkey, which shoulders that burden alone and tries to be the voice of the oppressed? While there is so much pain and risk of war in the world, what does the silence of big, wealthy and powerful countries, those champions of democracy, their leaders and nongovernmental organizations mean? How should it be interpreted? It is natural that after tweaking universal notions so much for the sake of national interests, betraying the ideal of democracy to this extent, such an artificial confusion of these concepts emerges. When a terrorist organization is supported with the purpose of creating a state for it in line with a country's interests, naturally it is necessary to give prestige to that killing machine. For this to happen, first one has to blur the definition of terrorism, change it or produce alternative versions. The same is true for both putschist generals and perpetrators of massacres. When a coup is in one's interests or it is one actually plotting that coup, calling it a coup is not possible. Then it becomes necessary to portray the victim of that coup as a dictator and to discredit him. It seems to go smoothly up to that point, but after a time one may forget where one has departed from and destroy the very ground they stand on. One may pay the price for tinkering with values so easily by not being able to find them when needed. Indeed, that is what happens. Those more experienced in unprincipled behavior emerge as winners when there is such a compromise on principles. One may even lose what they have when they begin to use Islamophobia as political lever or engage in anti-immigrant discourses, since there are always those more adept at doing this. Have not the supposed champions of democracy in Europe enabled bigoted, monolithic and fascist groups to move to the center by betraying their values? Take the current pressures on the Sabah daily in Germany as example. Germany criticizes the closure of media outlets linked to the Gülenist Terror Group (FETÖ) behind the July 15 coup attempt and to the PKK, and the arrests of some members of these entities on charges of terrorism and coup plotting but not for journalistic activities, under the pretext of press freedom. But it tries to silence a newspaper that has no relation to such crimes, just because it reveals its propaganda. Similar double standards only make our world more unlivable. Universal values have not emerged easily. They are the products of lessons learned after 70 million people had been killed, mostly in Europe, and Nazi fascism had devastated the continent. So it is impossible to understand why these values are wasted so clumsily and readily. But why is Recep Tayyip Erdoğan, who throws these weird facts in the face of the world, hated? Who can contest the truth of his remarks at the U.N. summit? While genocide is going on in Rakhine, where are those who had invaded Iraq and Afghanistan under false pretenses? Are wealthier nations ashamed that it is Turkey that provides the largest financial assistance to poor countries that are mired in civil wars? Does anyone get ashamed in the civilized world because the EU is using the $6 billion it has pledged to Ankara on condition that it be spent for refugees but is delaying the payment as a political trump card? Who would have cared for Rakhine if it had not been for Turkey's efforts? Are these not bad signs for the world? Erdoğan was seeking a modicum of conscience that could realize this drift when he said: "Regardless of the color of our faces and eyes, the color of our tears is the same." He just warned against another shameful case in Rakhine, similar to past genocides in Rwanda and Bosnia. Even a fraction of the energy spent on plotting coups in countries tens of thousands of kilometers away would have been enough to protect these unfortunate people and to develop poor countries that had collapsed as a result of their colonial past. Thus, a source of terrorism would be eliminated. Experts on terrorism agree that no terrorist group can exist without the support of at least one state. That is why a common definition of terrorism is shunned. But why do we not see principled actors anymore that can bravely tell all of this to the public? Has confidence in democracy vanished, or is everyone dependent on another and unable to act? Perhaps one of the reasons for the hatred of Erdoğan is that he is the only influential leader who says the emperor has no clothes. One of Turkey's virtues is that it says what it is going to do openly and is predictable. It declared its intention for Operation Euphrates Shield and conducted it. The same is true for both Idlib and the referendum in northern Iraq. Turkey does not act behind a mask. Moreover, Turkey does not aim to grab oil and natural gas reserves anywhere. It makes efforts for the good of Syria and Iraq and all the peoples living there. Of course, Syria and Iraq are also a matter of domestic security and a red line for Ankara. Turkey has been saying the same things for the last 15 years and what it has said has come true one after another. Turkey is a democratic, modern and secular Muslim country that belongs to both the West and the Middle East and can talk to each. It is a safety valve for Europe, a powerful country that is an example and beacon of hope for oppressed people. The democratic awareness of its people is so high that they managed to repel putschists during the July 15 coup attempt in which 249 people were killed. Some 30 million citizens stayed in squares for 29 days in order to protect democracy. Have you ever witnessed such an epic of democracy in the recent past? This praiseworthy country is severely chastised today. While a political leader who has won 12 elections, thwarted coups and made Turkey much greater in every area is accused of being authoritarian, putschists who massacred their own people are treated like heroes. The world cannot afford such hypocrisy. How can one explain that a terrorist group that attempted a coup in a NATO member country has its headquarters in another NATO country, i.e., the U.S.? And how can one explain the 3,000 truckloads of heavy weaponry and military supplies the U.S. provided to another terrorist group, the Democratic Union Party's (PYD) People's Protection Units (YPG) forces, which is the PKK's affiliate in Syria? How can they give a terrorist group weapons that are denied to Turkey when it wants to buy them when the PKK is still killing babies, politicians and civilians in Turkey. We can say the same of Germany, too. Germany has become a safe haven for FETÖ and the PKK. Yet Germany does not stop harassing Sabah daily. Hatred of Erdoğan is not enough to hide all these dark truths. The axis of Western democracy has shifted and Turkey frequently points this out in good faith. There is a saying in Turkish: A real friend tells the bitter truth to your face. Terrorist organizations are temporary, but states are permanent. Turkey will overcome these injustices and become stronger to the dismay of those who want to see it weaken. We are now waiting for brave political leaders, philosophers and civil society leaders in the West to come out and voice these truths.